The media has been suggesting, at the very least, a hiatus in property price increases in the London area, although it appears the principal price fall sufferers have been at the real high end of the market, and in the outer zones with Zone 1 properties perhaps less affected. 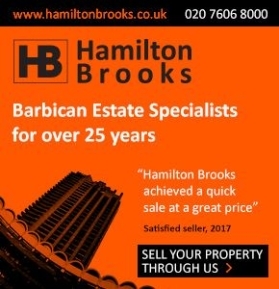 Certainly, if one checks asking prices on the websites of those agencies specialising in Barbican properties, prices seem to be holding up pretty well. But – and there’s always a ‘but’ – if one talks to the agents there is an indication that Barbican flat pricing levels are at best flat and may even be turning down a little. The writer, although someone who voted to remain, is not as pessimistic about any likely post-Brexit downturn as some. A good amount of the doom and gloom scenarios that surface in the press are from those opposed to Brexit both in the UK, and in Europe – the latter using the media to make their negotiating points. Scare tactics are the political spin of the day and In the long run it is to everyone’s benefit to come up with a series of win-win compromises. Maybe I’m over-optimistic but I suspect that in a few years’ time one will look back and wonder what has happened to the dire predictions of economic downturn once Brexit is a fait accompli – if indeed it is. However, Computershare Loan Services, which administers more than half of all third-party serviced mortgages in the UK, has forecast that the value of 2.69% of properties in London could drop below the outstanding mortgage balance on the property if average house prices fall by 18.72% as they did between 2006 and 2009. The figure is, however, the second lowest for any UK region except the South East and lower than the proportion affected after the last financial crash, when a similar drop saw between 7 and 11% of properties fall into negative equity. This is an improvement that Computershare attributes to providers lending more responsibly and complying with new regulations. For the Barbican, though, the Crossrail effect (see below), should mitigate any property value falls and the number of properties falling into negative equity could well be minimal, even if the worst case scenario arises. Overall, we see property prices after a period of perhaps zero, or minimal, increase returning to their seemingly inexorable upwards path and micro-markets like the Barbican, which will benefit from the positive impact of Crossrail, will continue to be as positive as ever they were. Indeed Crossrail – and there’s an article in this issue of Barbican Life looking at the latest assessment of benefits accruing to those living along the route – will be the balancing counter to any negative effects of Brexit (if there are any). The Barbican already has perhaps the best transport links of any residential complex in the whole of London with east-west and north-south tube lines and good bus route services at either end, and Crossrail, with station access at both the eastern and western ends of the complex, will further enhance these. Roll on 2019 when Crossrail (or the Elizabeth Line as it has now been named) should be fully open. Mark Scoging at A.W. Childs: With cautious projections still lurking, we have seen tenant demand continue to edge higher and Landlord instructions have continued on an upward trend. We have witnessed a ‘’bounce back’’ in rental prices and still remain very optimistic in the City of London’s future as we become closer to the UK’s exit from the EU. Glen Cook: Good news for the rental market: We have seen a near 15% increase in rental values in the last 6 months, demand has picked up but the supply has dropped, a number of accidental landlords have now sold and so restricting rental stock levels hence driving up rental values. Demand remains strong and outstripping supply.